A quiet end to what had promised to be a more seminal week for the euro vs dollar pair, with the triple whammy of US rates, European rates and finally Non Farm Payroll having little effect on the market, with the pair finishing marginally higher on the week, and with a consecutive spinning top candle on Friday to match that of Thursday. 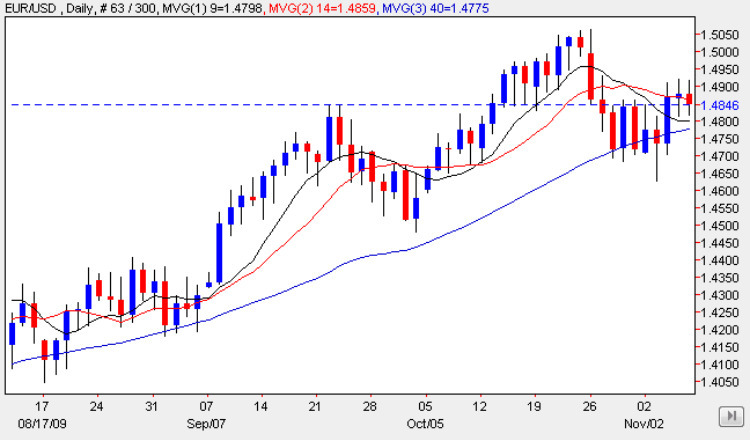 Overall, the technical picture for the euro vs dollar remains bullish, with both Thursday and Friday’s candles finding good support from the 14 day moving average, as they sit perched above all three moving averages, and with some modest potential support immediately below in the 1.48 price region, and the strong hammer candle of Tuesday still in evidence, it would be no surprise to see the pair rise in early trading this week. The key price level remains the recent top just above the 1.50 price level, and should we see a break and hold above this point in due course, then the short term target of 1.52 and subsequently 1.55 remain firmly on the horizon for the euro vs dollar pair in the medium term. With no items of fundamental news on the economic calendar for the US today and only second tier releases in Europe – German trade balance, German Industrial Production and Europe Sentix Investor Confidence prices will be technically driven and more responsive to wider market sentiment. You can keep up to date with all the latest fundamental news on the economic calendar, latest currency news and live currency charts by simply following the links. I have also included details on an excellent ECN broker.